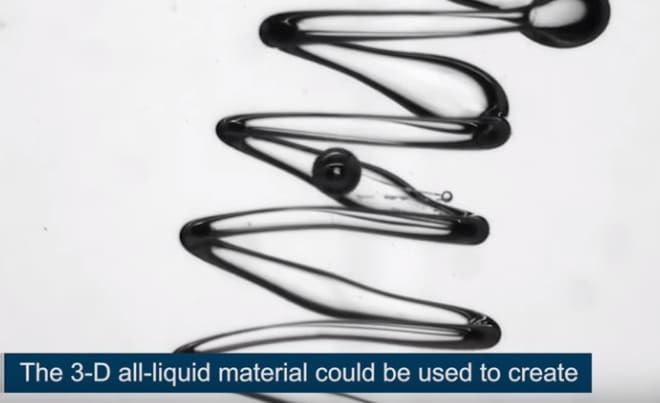 Just as people have begun to understand and use 3D printing, here comes a new technology: Liquid 3D printing from one of the top government labs. With 13 Nobel prizes, 70 scientists who are members of the National Academy of Sciences (one of the highest honors for a scientist in the U.S.), numerous National Medals of Science under their belt, the Lawrence Berkeley National Laboratory (Berkeley Lab) knows a bit about how to adapt and tweak materials properties to get what they want. Recently, the Berkeley Lab has developed a way to print 3D structures composed entirely of liquids (Full details linked at end of post). There are existing 3D printers that can do this, so, naturally, the Berkeley Lab team modified an existing 3D printer to do what they wanted: inject threads of water into silicone oil. This allowed them to sculpt tubes made of one liquid within another liquid. This YouTube video from the team at Lawrence Berkeley National Laboratory elegantly demonstrates and explains how they got it to work. The Berkeley Lab team believes their all-liquid material could be used to construct liquid electronics that power flexible, stretchable devices. If you have seen the new Samsung flexible, foldable phone screen, you have a rough idea of the concept in action. Read more details about how the Lab created a nanoparticle “supersoap” – a surfactant that locks the water in place as they create tubes. If you are an educator interested in other materials science topics, please check out The National Resource Center for Materials Technology Education (MatEdU) with its database of educator-focused curriculum resources. You may also be interested in the upcoming annual M-STEM event that brings together students, faculty, and business to strengthen understanding of Science, Technology, Engineering, and Math (STEM) principles, especially relating to materials science, and to enhance K-20 technology education integration. Read more about M-STEM 2018 on November 5-6, 2018 at the University of Alabama at Birmingham.